✿ Versatile comb is a essential comb that can keep your pet clean and healthy by removing tangles, mats, loose hair and dirt. 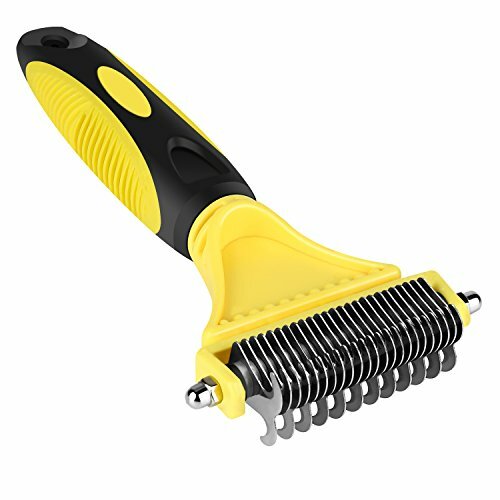 ✿ The dual sided 12+23 teeth comb will be your best choice to cut even the longest and densest coats of dogs, cats, rabbits, long haired pets. ✿ Made of high quality TPR material, Double-sided stainless steel blade with rounded teeth that takes on difficult knots and mats with ease without causing irriation to your pet's skin..
✿ With aesthetic and daily massage it helps to clean the skin, accelerates the blood circulation, makes the skin natural light and improves immunity. ✿ Convenient and lightweight ergonomic handle with the design of non-slip grooves preventing fatigue and discomfort of the hands,so you can get professional results at home without feeling the strain on your wrist. If you have any questions about this product by ONSON, contact us by completing and submitting the form below. If you are looking for a specif part number, please include it with your message.